If there ever was a sport which made a world event which the whole world would watch, it would be soccer. Soccer is closing in on becoming one of Australia’s most beloved sport. With A-league being popular among Aussies as ever, whether you would like to play, watch or bet on soccer, you need to know every about the game also known as Football in many parts of the world. Early evidence of soccer being played as a sport is found in China during the 2nd and 3rd centuries BC. In China, it was during the Han dynasty that people dribbled leather balls by kicking it into a small net. Recorded facts also support the fact that Romans and Greeks used to play ball for fun and frolic. Some facts point to Kyoto in Japan where kicking of ball was a popular sport. The first set of rules for soccer, also known as football in many countries was made by the London Football Association in 1863. Football/Soccer became a major sport in England and Scotland in 1872. The idea of professionalism was introduced in 1885 and the first full time league was made in 1888. In 1908 soccer came into the Olympic Games. Italians, Austrians and Germans drew to Europe, while Argentina, Uruguay and Brazil adopted the sport in South America. Modern soccer was introduced in Australia in the late 19th century by mostly British immigrants. It has since become one of Aussie’s most popular sports. FIFA was established in the year 1904 and by early 1930s; different leagues were operating from various countries. FIFA is credited with organizing the first world cup in Uruguay. The history of soccer is rich with events, development and its growing craze all over the world. The sport of soccer is considered to be the world’s most popular sport. In soccer there are two teams of eleven players on each side. Soccer is played on a large grass field with a goal at each end. 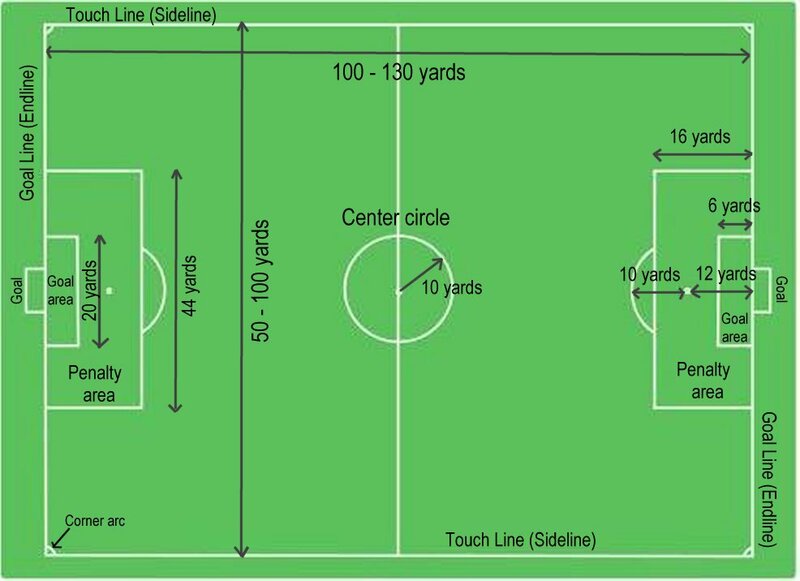 The soccer field, or football pitch, is flexible in size. Not all pitches are the same size, though the preferred size for many professional teams’ stadiums is 105 by 68 metres (115 × 74 yd) with an area of 7,140 square metres (1.8 acres). All line markings on the pitch form part of the area which they define. For example, a ball on or above the touchline is still on the field of play; a ball on the line of the goal area is in the goal area; and a foul committed over the 16.5-metre (18-yard) line has occurred in the penalty area. Therefore a ball must completely cross the touchline to be out of play, and a ball must wholly cross the goal line (between the goal posts) before a goal is scored; if any part of the ball is still on or above the line, the ball is still in play. The object of the game is to get the soccer ball into the opposing team’s goal. The key to soccer is that, with the exception of the goalie, players cannot touch the ball with their hands, they can only kick, knee, or head the ball to advance it or score a goal. At the start of a soccer period or after a goal, there is a kick-off from the center circle. At the kick-off all of the soccer players must be on their side of the field (the side they are defending). Only the player kicking the kick-off is allowed inside the center circle. After the kick-off the ball will be in play until the ball goes out of bounds or the referee calls a foul. Other ways of restarting a soccer game would be throw-in, corner kick, goal kick or penalty kick. Of the eleven players on a team, only the goalkeeper is a player position by rule. One player must be designated the goalkeeper and this player can touch the ball with their hands when inside the goalies’ box. All of the other players have the same position by rule. However, there are usually assigned roles and field positions to allow for team strategy. Typically there will be soccer players called forwards whose main object is to attack the opponent’s goal and try to score goals. Then there are defenders who hang back toward their own goal to help the goalie defend. Also, there are mid-fielders who drop back on defense or help out on offense depending on the game situation. Matches consist of two 45 minute halves, unless the two teams and referee agree otherwise before the start of play. The half-time interval must not exceed 15 minutes, and can only be altered upon consent of the referee. A referee may play added time because of substitutions, assessment of injuries, removal of injured players from the field of play, time wasting and any other cause. An abandoned match is replayed unless the competition rules state otherwise. A goal is scored when the whole of the ball crosses the whole of the goalline between the posts and crossbar, provided there is no infringement such as offside, a foul or handball. The team that scores the most goals wins the match. If the number of goals scored between the two sides is equal at the end of a match, it is a draw. When competition rules require that there must be a winner, the outcome will be decided by either away goals rule, extra-time or penalty kicks. The law states that if a player is in an offside position when the ball is played to him or touched by a teammate, he may not become actively involved in the play. A player is in an offside position if he is closer to the goal line than both the ball and the second-to-last defender, but only if he is in the opposition half of the field. The rules of the game are set down by soccer’s world governing body, FIFA. The association’s official handbook is a 140-page document, which includes detailed discussion of every foul, infraction, and regulation in the game. Here is the summary of game fouls in soccer. When the referee stops play for certain fouls, he may award a team a direct free kick or an indirect one both depending on having to touch another player or not. A referee can charge the team or a player with fowls if a player kicks or attempts to kick an opponent, trips or attempts to trip an opponent, jumps at an opponent charges an opponent strikes or attempts to strike an opponent, pushes an opponent, tackles a player and comes in contact with the player before the ball, holds and opponent or handles the ball deliberately. There are numerous different bets you can make on the sport of soccer using an online sportsbook and you should become familiar with the bets so you know what your options are in each game. Most common betting option is on the Match Odds also known as Moneyline and is presented as 1X2, where 1 is the home team, X is a draw and 2 is betting on a win for the away team. Furthermore, punters can wager on some specific event such as number of goals, half time score, first goalscorer, anytime goalscorer, over/under goals etc. Soccer has a wider and more in-depth betting range than most sports. To count the number soccer leagues around the world would be limitless. All the official leagues are divided into divisions authorized under FIFA. These divisions are namely CONCACAF, CONMEBOL, UEFA, AFC, CAF, OFC. As of January 1, 2006 Australia is a member of the AFC. Football Federation Australia, also known simply as FFA, is based in Sydney and is the governing body for association football in Australia. Although the first governing body of the sport was founded in 1911, FFA in its current form was only established in 1963 (as the Australian Soccer Federation), later reconstituted in 2003 (as the Australian Soccer Association), and then renamed to the Football Federation Australia in 2004. The A-League is the top level association football league in Australia, run by Football Federation Australia. The A-League was established in 2004 as a successor to the National Soccer League and commenced in August 2005. The league is currently contested by ten teams; nine based in Australia and one based in New Zealand. Teams in A-League: Adelaide United, Brisbance Roar, Central Coast Mariners, Melbourne Heart, Mebourne Victory, Newcastle Jets, Perth Glory, Sydney F.C., Wellington Phoenix and WS Wanderers. Among these teams Melbourne Victory, Brisbane Roar, Western Sydney Wanderers are highlighted as one of the best clubs in the league. In 2013, FFA launched the National Premier League or NPL for the semi-professional state-based competitions in Australian football. Each territory and state will run heir NPL competitions. This national soccer banner in Australia acts as the second tier of the sport in the country below the A-league. The Australian national association football team represents Australia in international football. The team has represented Aussies at the FIFA World Cup tournaments 3 times in the past and are scheduled to play in World Cup 2014. 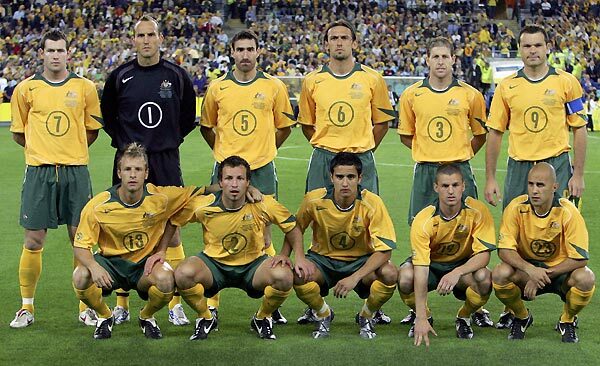 As of October 2013, FIFA has ranked the Socceroos 59 out of 207 countries.